As someone who was an undergraduate in the 1960s, I will always have a soft spot in my heart for reflections on the "anti-psychiatry" era, even when my brain challenges authors' arguments and wonders if their conclusions are built on a proverbial house of cards because their foundation of facts is flawed. Like so many others, tales about R.D. Laing's carnivalesque Kingsley Hall, opened in London's East End in 1965, enchanted me. Laing himself later recanted his colorful clinical theories about curing psychosis by expressing psychotic symptoms full-force. Laing attributed mental illness to a sick society, unlike some fellow anti-psychiatrists (most notably, Thomas Szasz, MD) who denied the existence of "mental illness" as a distinct clinical entity. Curiosity alone compels me to learn about later incarnations of this countercultural movement, and to read intelligent discourses on the subject (that contrast with Scientology's emotive anti-psychiatry allegations). "Anti-psychiatry" sentiment has a complex history, and dates to Mary Baker Eddy's Christian Science, which began in the 19th century, long before the psychedelic sixties (per the esteemed historian of psychiatry, Norman Dane). This anti-psychiatry movement is gaining steam again, albeit for different reasons. This time, "the movement" is led by sociologists more than psychiatrists. Sociologist Bruce M.Z. 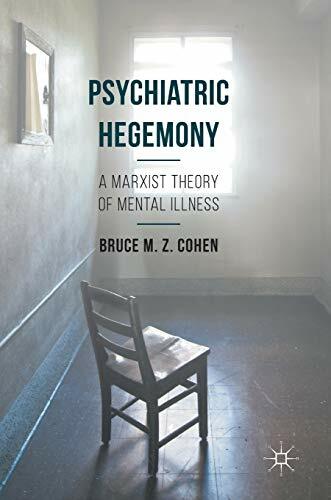 Cohen's "Marxist Theory of Mental Illness"clearly belongs to the anti-psychiatry camp. Cohen attributes mental illness to class struggles and economic gaps among social classes and to psychiatrists' quest for economic hegemony and power plays via prescriptions for psychopharmaceuticals. Simply put, Cohen argues that monies that were once allotted to now shuttered psychiatric institutions are now diverted to pharmaceutical companies that sell "chemical restraints" and to psychiatrists, the professionals who prescribe those psychopharmaceuticals products (and to a lesser extent, order ECT). It remains to be seen if Cohen's theories will enjoy the staying power of sixties' icons such as psychiatrists Laing, Szasz, and Cooper, or the sociologist Goffman or the philosopher Foucault, whose scathing historical analyses have since been refuted because they were built on flimsy facts. It also remains to be seen if Cohen would revise his theories, were we working in the U.S. and witnessing the collapse of "psychiatric hegemony" in the wake of the expansion of prescriptive privileges to nurse practitioners and physicians' assistants, and, to a much lesser degree, to prescriptive psychologists. Nevertheless, Cohen's theories are worth considering, so long as we recall that his sociologist's perspective strays far from clinical considerations (except for his closing chapter, which harps back to the mid-1970s and recommends banning all ECT treatments). As a university lecturer in sociology, Cohen uses many sociological and even economic terms and quotes several luminaries in social theory and philosophy, making some of this work beyond the scope of most "psy-professionals," as he calls them. His explications of Karl Marx's sociological theories, as they relate to his topic, are useful to all readers. His in-text references liberally cite certain "outlier psychiatrists" that may cost him credibility among psychiatric readers, but the bibliographic endnotes after each chapter offer informative sources. In his concluding chapter, he contends that "the psy-professions were created and progressed to regulate and manage western populations through personalizing social and economic issues, pathologizing political dissent, policing and punishing problematic and deviant groups and reproducing the dominant norms and values of the ruling elite through psychiatric discourse." He is not the first to make such claims nor will he be the last. His allegation that the sociology of mental health is at risk of becoming "an arm of the state" partly because researchers receive state funding is more unique. One parenthetical references made a special impression on me. Cohen mentions "Mad Studies," which entered the curriculum of a Canadian university. Mad Studies are supposedly an offshoot of "disability studies," a growing academic field that inveighs against "ableism". Such studies evoke the 70s-era madness movement, its rise and decline, and its apparent revitalization in the present day. "Madness Network News" (MNN) broadcast on New York City's now-defunct WBAI radio station through the late 1980s. MNN was an outgrowth of a 1972 San Francisco-based newsletter by the same name. The newsletter sparked the "mental patient liberation movement" in an era that birthed a variety of civil rights and identity movements. Cohen acknowledges his consultations with members of "psychiatric survivor groups" who remind him of parallels between their cause and his contentions. It is curious that Cohen lives and works in New Zealand, which is the only nation besides the U.S. that allows direct-to-consumer pharmaceutical advertising (DTCA). DTCA has been shown to increase patient demand for prescription medications and for pricier brand names at that. Much DTCA does not directly advertise products but instead "educates" potential "consumers" about illnesses that they (or their doctors) may never have known about, were it not for those compelling consumer-oriented "infomercials." Given that background, it makes sense that Cohen is especially attuned to economic forces propelling mental health diagnosis and treatment. It will be interesting to read a similar study—with spreadsheets and accounting ledgers--about the uptick in private equity investments in alcohol and drug rehabilitation and eating disorders centers in the U.S.
On a final note, I feel compelled to revisit Cohen's comment about the decline of interest in the intellectual underpinnings of psychiatry in the past 35 years. Is he saying that intellectual discourse that was in vogue in the sixties and seventies faded after 1980, when DSM-III was published? DSM-III focused on validated diagnostic criteria, as it strived for uniformity and veered away from psychodynamic explanations of psychiatric symptoms. Sociological or socioeconomic explanations also faded away. If Cohen is correct, then perhaps his contention explains my ­encounter with a star medical student soon after. The student had earned highest honors in all rotations and would soon be elected to AOA medical honor society. Yet when I mentioned Marx's claim that material conditions mold human consciousness, rather than the other way around, she said, in all earnestness, "Oh, you mean Groucho?"